Summertime means sunshine, vacations, care-free weekends, spending time outdoors with friends - and it means sunburn. People sunburn from either not wearing sunscreen, not applying enough sunscreen, or not reapplying sunscreen on a regular basis. While there's no quick-fix to treating your burn, there are ways to cool the skin and ease the inflammation and discomfort associated with looking like a lobster. The obvious? Stay out of the sun and drinks lots of water. Burned skin cannot repair itself if it's still being damaged. Keep skin cool with a cool to lukewarm water bath or cold compresses gently placed on the skin. For a more soothing variation, try adding a few cups of cool (not cold) milk to your compress or bath. The milk proteins create a thin film on the skin to relieve inflammation, the pain-causing component of sunburn. Moisturize, but be careful as to not over-moisturize your skin. Moisturizers can be thick and heavy, trapping in the heat, worsening the condition. Try a light-weight gel moisturizer. Our VP swears that Korres Yoghurt Cooling Gel once saved her from a summer of pain while in Greece. It provides instant relief with moisturizers and extracts for the skin. For added relief, store this in the refrigerator for extra coolness. If you'd like to go the traditional route of using store-bought aloe, make sure that you're using purchasing pure aloe - many kinds at the store only contain a fraction of the aloe needed to provide any real relief. Need something a little more instantly than running to the store for a product? Use Korre's inspiration and apply cold yogurt to the affected areas. A thick, plain yogurt works best. Leave it on for fifteen to twenty minutes before gently rinsing off and reapplying. It's tempting to let Aunt Peggy pick at the peeling skin or to pop the blisters, but your safest bet is to be patient and let everything heal on its own. Focus on relieving the heat and redness, and the healing will come naturally. The best treatment yet? Prevention. Apply sunscreen generously and regularly. A typical adult should use one ounce, or a shot glass full, of sunscreen to protect exposed areas of the body. Adequate application before you go into the sun will give you about two hours of protection before you need to reapply - but more often if you've been swimming, sweating, or toweling off. Also, select a sunscreen that offers UVA protection in addition to UVB - look for zinc oxide, titanium dioxide, or avobenzone. EVMAN's Moisture Protect SPF 20 is a great matte-finish moisturizer that protects you from the sun without looking greasy. 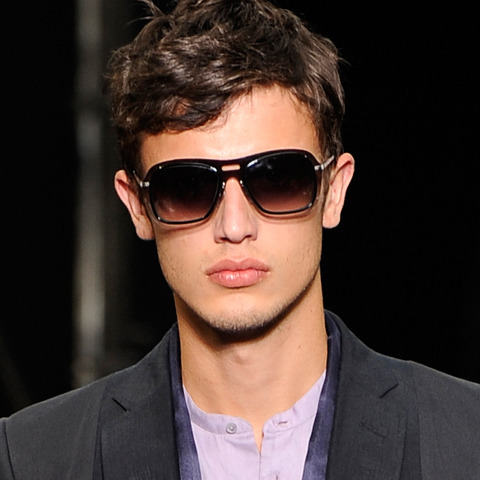 Wearing sunglasses physically protects the eye area, thus reducing the effects of sun damage on your eyes. But how can eye damage cause wrinkles? The sun directly damages the eyes through UV exposure. UV rays strike the eye, accelerating the rate of cataract formation and worsening macular degeneration. It's your body's natural defense mechanism to squint the eyes to reduce the impact of UV exposure. In turn, constantly squinting from bright light can cause crows feet and other wrinkling around the eye area. Over time, the lines get deeper and the amounts of fine lines and wrinkles increase. Also, squinting to better focus your eyes can increase eye wrinkles over time - be sure to get your vision checked regularly. How do you prevent squinting? It's an uncontrollable reflex, so you should wear sunglasses with UV protection and wear a hat. Most importantly, choose lenses with UVA/UVB protection. The FDA recommends selecting sunglasses with 99-100% UVA/UVB protection - the sticker on the lens will tell you what the coverage is. You can also select larger or wrap-around-glasses for more physical protection from the sun's rays on your skin, but this won't help much with squinting your eyes. People with lighter eyes or bigger pupils are more sensitive to light and may be prone to more squinting, so choosing a polarized lens that reduces glare may be a good choice. Don't forget to couple quality lenses with SPF and a good eye product like Revitalize Eye Gel. With proven ingredients like glycolic acid, algae extract, Antarctic seaweed extract, and Vitamin E, it leaves skin feeling rejuvenated, supple, and young. NYC-based art duo FAILE had a killer show at Post No Bills on Abott Kinney last week. The classic cartoon style and poppy colors were ever-present in the show and we couldn’t have been happier. We can really relate to FAILE’s pieces. Some speak to our childhoods, others to the men we are today. Can’t help but think of The Gallows song “Orchestra of Wolves” at times looking at some of the exhibited works. The blocked puzzle form of FAILE, as well as the prints, were amazing. Check out the show for yourself in Venice Beach. The pieces will be on display until July 24th, 2011.